I did something this morning that I haven't done in a while: I stopped the car and took some pictures as I headed into work. I probably should have kept driving, because the clock wasn't moving any slower and the day was beckoning. 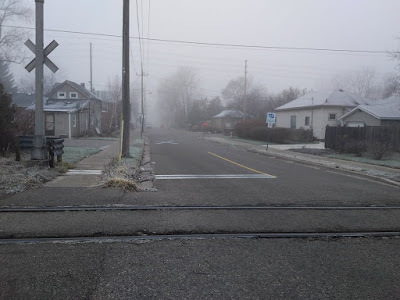 But the fog wasn't going to cling to this already-grey neighborhood forever, and the little photographic voice in my head was insistent: Now or never. So I parked. And shot. And felt the damp cold soak through my fingers and my coat. It felt like it was the right thing to do. Maybe not the most logic or rational thing given the time. But right all the same. Your turn: When was the last time you listened to those little creative voices of yours? I'm always wishing I had more time to stop and take photos on my way to work. I really should build some time into my journey so I can! Liking the muted effect in that picture - and the vanishing lines in one above of the tricycle.